Cream: Tube of 60 g.
100 g contains: Aceclofenac: 1.5 g.
Aceclofenac possesses analgesic, anti-inflammatory and antirheumatic activity. Administration of Aceclofenac in the form of cream allows the local treatment of painful and inflammatory processes. All types of local inflammatory and painful process, including traumatisms and acute or chronic musculoskeletal inflammatory pathologies such as tendonitis, tenosynovitis, sprains, luxations, periarthritis, distensions, lumbago and torticollis. Not to be applied to patients that have shown hypersensitivity to Aceclofenac or other non-steroid anti-inflammatory drugs, including acetylsalicylic acid. Do not apply on eyes, mucous membrane or open wounds. Do not apply in case of irritation mucous membrane. In case of hypersensitivity, withdraw the treatment. 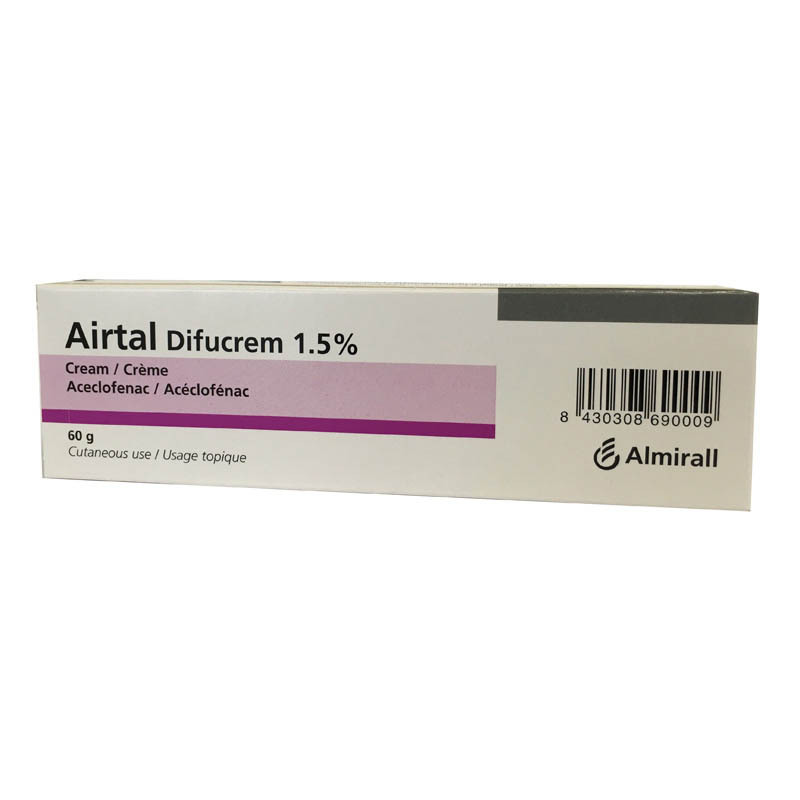 Use in elderly: Treatment with Airtal Difucrem does not require any special precautions. Use in children: The recommended dosage and indications for children have not yet been established. No interactions of Airtal Difucrem with other drugs are known. The application of Airtal Difucrem does not have any effect on this capacity. Its use is not recommended in nursing or pregnant women, as its safety has not yet been established. In some cases moderate or mild irritation, reddening and pruritus may occur. These symptoms disappear with the interruption of treatment. Topically apply from 1.5-2 g of cream, depending on the extension of the affected area, 3 times a day and gently massage. No overdosage has yet been reported. In the event of massive accidental ingestion, symptomatic treatment should be initiated.